The flagship model of EXEDY Racing Clutches: the carbon steel multi plate clutches. 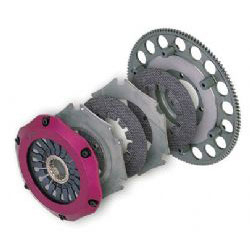 These clutches are light in weight, durable, and resilient to high heat, contributing to an improvement in track times. These complete bolt on designs require no additional modifications to the vehicle. The carbon materials are baked at more than 2000 degrees celsius which allows the the carbon material to dissipate heat far better than conventional metallic material.